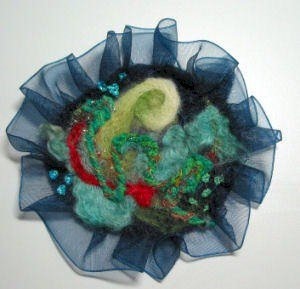 When Lily Kerns suggested a class on felting, I was not enthusiastic. 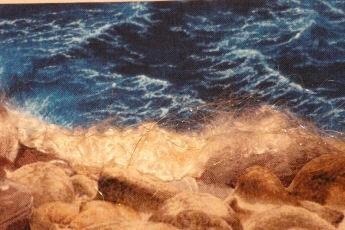 I had been hearing about these new machines that punched fibers together and I just couldn’t see the appeal. She assured me that she was not going to use a machine and that other people would see the beauty in this art form. She was right, of course, as she so often is about things that are a little off the beaten path. We have been offering the class for a couple years now and the variety of work done by our students goes far beyond anything I could have imagined. These and many other abstract pieces were lovely and showed great imagination. 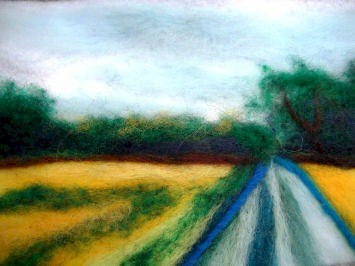 But the ones that really captured my heart and made me reconsider felting as an art form were the pictures that looked like they came from the Impressionist School. The very idea that anyone had that much control over the placement of loose fibers just blew my mind! 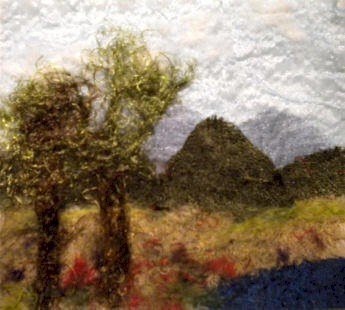 This piece by Vicki Fisher-Lerer makes me think of the Monet series on haystacks. She got the color down perfectly. So, I freely admit it – I was wrong. 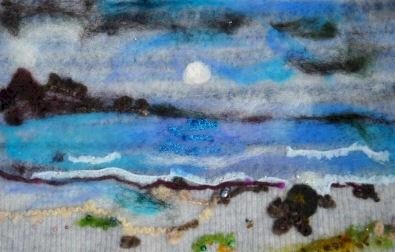 Whisper Felting must be a great class to inspire works like these. If this all appeals to you, the class starts this weekend and you still have three days to sign up. 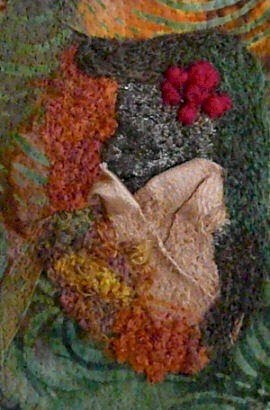 Visit us at www.QuiltUniversity.com.